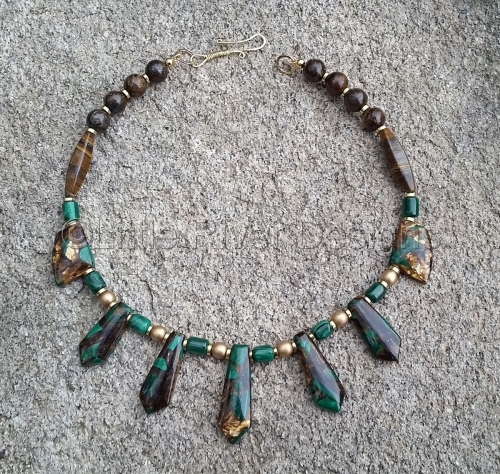 Malachite and bronzite pendants and accents with golden Czech pearls and brass. 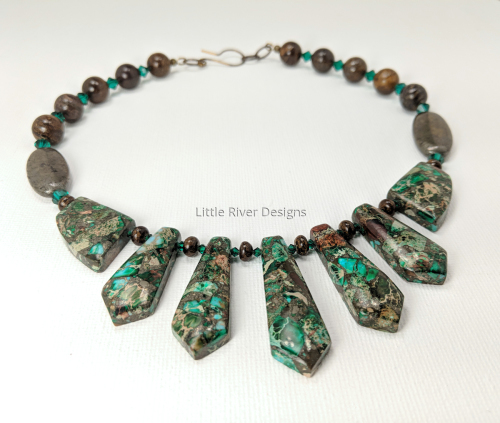 Emerald impression jasper and pyrite pendants complimented with bronzite and emerald Swarovski crystal. 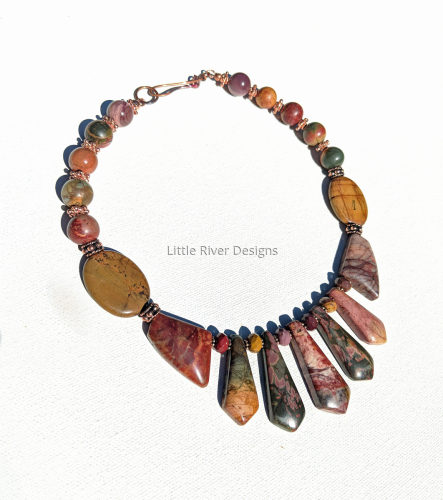 Gorgeous red creek jasper necklace with mookaite jasper an copper accents. 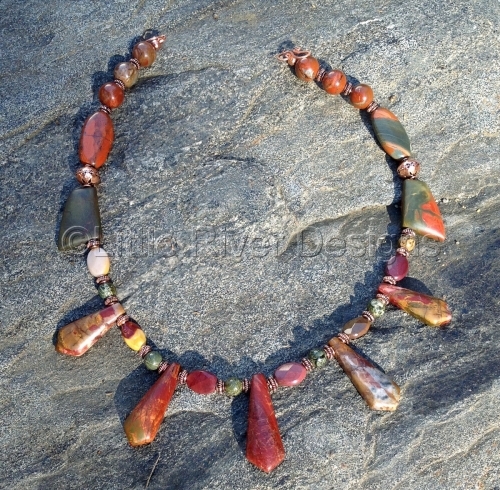 This is an eighteen inch statement necklace with 3 red creek jasper pendents wrapped in sterling silver. 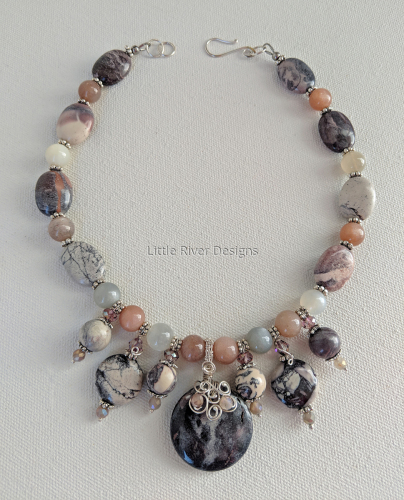 A blend of pinks, brown, grays and greens, it is accompanied by smokey quartz, rhyolite, unakite and cherry quartz stones clasped in handmade sterling. Sea foam as the surf leaves the shore. 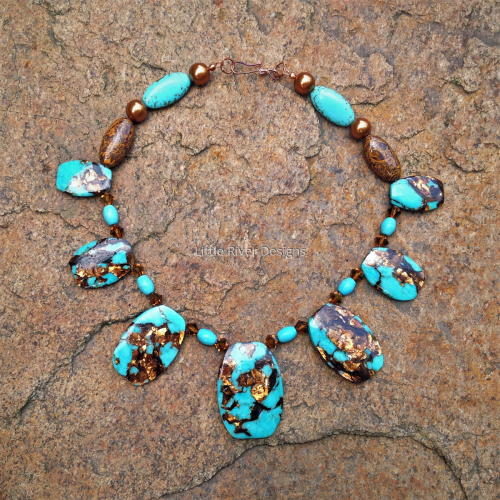 An ocean inspired necklace with aqua terra jasper, Swarovski crystal and hematite accents. 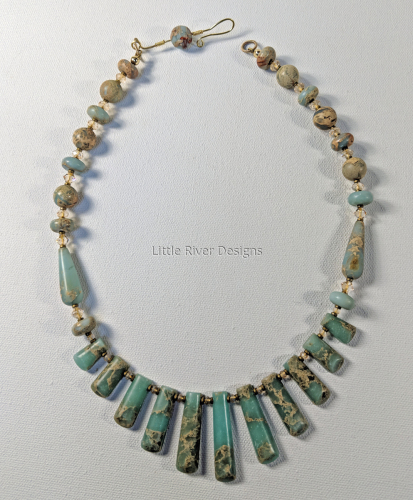 Finished with a handmade brass clasp this is a 20 inch necklace. 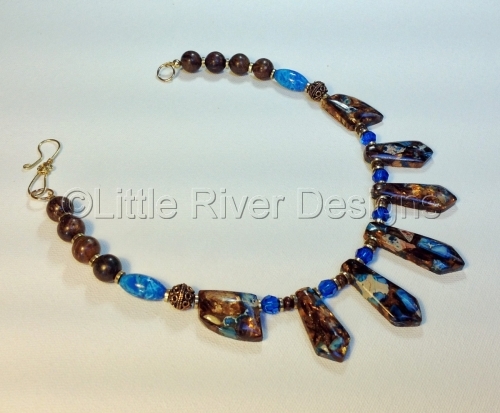 Earrings have a two and a half inch drop. 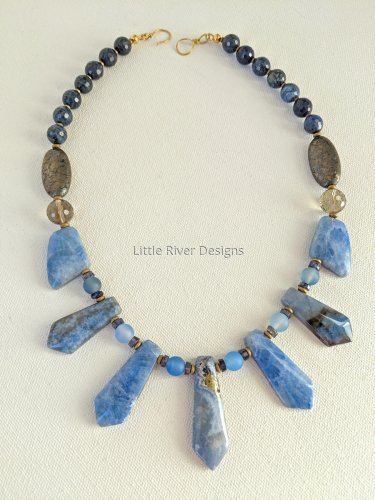 Blue impression jasper and bronzite pendants accented with blue jasper, brass and Swarovski crystal. 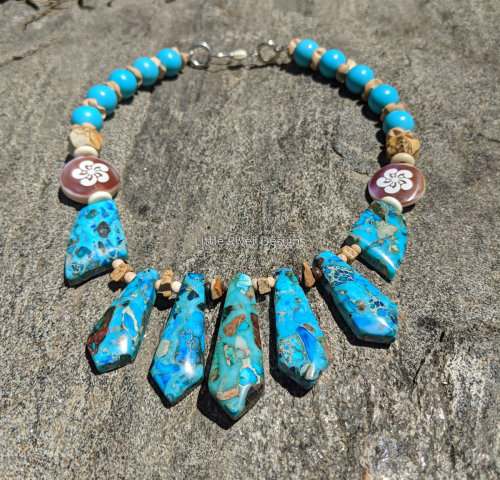 Red creek jasper pendants mixed with brecciated and apple jasper with faceted mookiate and copper mixed in for good measure. 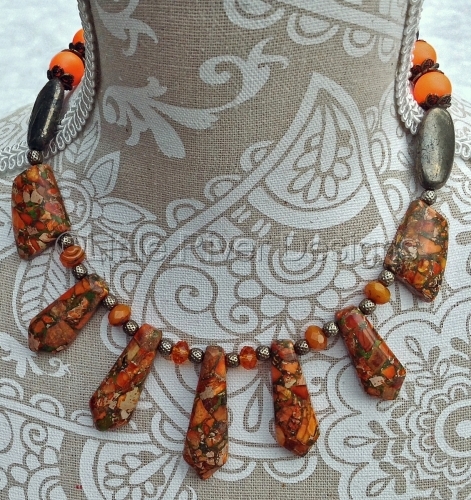 Orange impression jasper and pyrite pendants team up with golden pyrite, Vintaj brass and Swarovski crystal. 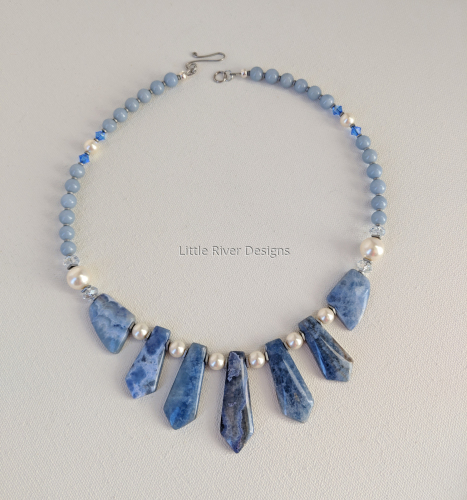 Denim Blue Jasper choker style necklace with angelite, crystal pearls and sterling silver. 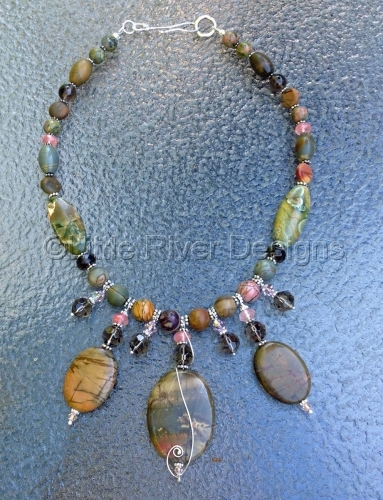 Denim Jasper with artic line, dumorite, pyrite and smokey quartz accents. 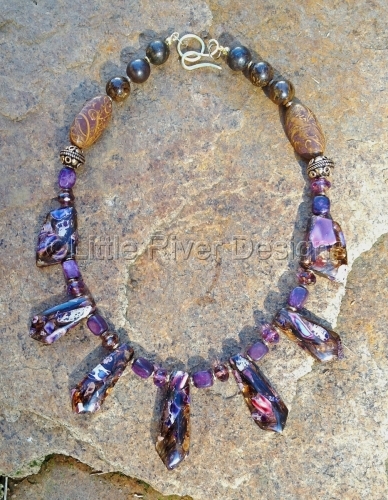 Sterling silver hand wrapped Terra Rosa Jasper pendant accented with luminous moonstone, jasper and Swarovski crystals.